Today the Classicist Blog announces a new book: The Municipal Art Society of New York: 10 (Ten) Architectural Walks in Manhattan. That seem very good to this architecture tourist. Every town deserves a tour book. New York deserves 10x10 of them. The Classicist Blog introduced me to the © 2009 The Municipal Art Society of New York, my newest hero. You see, the Society is about the "art" of cities rather than fine art. You can purchase it from Urban Center Books. Here are the tours feature in the book. Atlanta's New Urban neighborhoods -been there? Hooked on Houses is hosting her "Hooked on Fridays" blog party; I hope y'all will click here and have look. This week I'm hooked on Atlanta's "new urban neighborhoods. The Congress for New Urbanism will be in Atlanta - May 2010. Below is a short promotional video for the conference. As an Atlanta fan of new urbnanism this is particularly interesting. It shows the names and faces of several movers and shakers. The sponsor list is also interesting. Attention: Atlanta Architecture Tourists: Can you can identify the locations in the video? Have you been there? Atlantic Station for sure - Ikea is there. But Technology Square? Glenwood Park? Midtown at Piedmont Park? Market Village in Smyrna? Serenbe? I would add Virginia Highland / Morningside which isn't new but it is nice. If you can do only one, go to Glenwood Park perhaps as a side trip from the zoo. It's just one block from I-20. It is a charming, compact, labor of love; the Atlanta development I most want to succeed. Attention: Atlanta Art Strollers: Your host and the Architecture Tourist Auxiliary are heading to the Castleberry Hill Art Stroll this Friday (June 25, 2009). We're starting at the Castleberry Point Lofts because they are hosting their own artist market, have free wine in 2 open house loft units and you can go on the really amazing roof. Plus Jerry Miller, the developer, is a friend of ours. 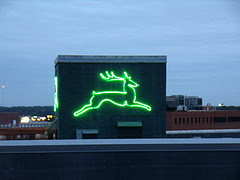 The neon "John Deere" sign above is a Castleberry Hill landmark. This Sunday Joni at Cote de Texas rocked design bloggers in her critical post "Good Money for Nothing." As I write this on Monday about 9:30 pm, there are 159 comments. Design blogs are so nice, so polite, so deferential, and so in the "if you can't say something nice..." vein. Design blog comments are deference squared. If your comment is too strong, folks won't like you and certainly won't visit your blog. Can you imagine a 1st time commenter criticizing Cote de Texas? Architecture blogs and opinion columns are often very critical. Design - not so much. So I take blog comments with a little vinegar. Joni is one of the few who could do it and even she was a bit reluctant: " I was a little timid about posting this." It takes a strong following to go negative. Thanks to Joni for giving readers a chance to be critical and blow off some steam, at least for a while. Thanks to the Skirted Round Table. I think the Great Skirted Ones, Megan Arquette, Joni Webb, and Linda Merrill are shaking things up a bit, maybe in ways they didn't expect. I am certainly enjoying it. P.S. This above picture is the punch line from one of my favorite posts, "Hooked on decor for families and tasteful arm wrestling." Tiny peach duplex, green roof, chunky dentils, and tasty column details. This expands my tour of Sampson Street started with my "Virginia Cotton Docks - Sampson Street, Atlanta" post. Sampson will never be in any guide book, just an interesting little street made for folks like me. Irwin Street is more or less the dividing line between the Old Fourth Ward and Inman Park. It parallels a railroad centered industrial / warehouse corridor. It's been "urban poineered" and the Beltline Project may pump it more even more. We're looking west on Irwin Street from the southern end of Sampson Street. The tower is the local landmark. The diagonal street just the the left of the tower is Atlanta's famous Auburn Avenue, the axis of the King Historic District. The Studioplex Lofts is a massive former warehouse at the corner of Irwin, Sampson, and Auburn. It's now live/work. They chopped out the center to make a sunlit corridor. The north end of Sampson Street dead ends into Highland Avenue. Looking south down Sampson. To the left you can see the new-gentry condo building that hosts the P'cheen Restaurant. This used to be a scrap metal yard. This part of Highland is booming with a new urban scene. I don't know for sure but the tiny lots suggest a history of mill houses. Here are two modern versions of the skinny house. The Irwin Street Market always makes me smile. Sampson Street isn't a destination but if you are in the neighborhood, don't miss it. Hooked on Houses is hosting her "Hooked on Fridays" blog party; I hope y'all will click here and have look. There is a tiny, sentimental reward and a map at the end of this post. I've extended this little tour of Sampson Street in this on a new post. You'll have to imagine the interior decor of these warehouse lofts in Atlanta's Old Fourth Ward. I'm hooked on the Virginia Cotton Docks. On the dead end of John Wesley Dobbs at Randolph Street. There are some for rent. You might drive by this sign 100 times before you really looked. These were real track side warehouses. I know nothing about their history. These were obviously turned into lofts long before lofts were cool and back when the Old Fourth Ward wasn't so nice. Mint Gallery is there. An Artist's opening would be the perfect excuse for a visit. Here is the business end of the Virginia Cotton Docks. It's on a railroad siding serviced by what will be Atlanta's Beltline. Careful on that first step. Across the Beltline is another old warehouse, now a restaurant. I meant "future" Beltline, here is a view to the north. This will be a greenway, a low tech transportation corridor, or something. Everybody is excited about it. Here is unit "M" You'll need to click the picture and make it bigger. It's a rather shabby front for what must be very cool loft. These windows and doors are not standard warehouse equipment. I'd enjoy a peek inside. ...where you might find a couple taking engagement pictures in front of Isadora's Doodles. I sure appreciate your dropping by. There is more to see on this little street. It's just blocks from the King Historic District, Inman Park, Cabbagetown, Little 5 Points and more. And don't miss the wonderful Wigwam. I'd be happy to help you find your way. Thanks to Atlanta blogger Aspirations of a Southern Housewife who also enjoys Irwin Street Market and the Old Fourth Ward. I've extended this little tour of Sampson Street in this on a new post. Atlanta's Architecture Tourists cruise the grounds of the Battle of Atlanta. Many of Atlanta's most interesting older neighborhoods and houses are there: Poncy-Highlands, Inman Park, Grant Park, East Atlanta, Glenwood. To East Lake, from Reynolds Town to Edgewood to Kirkwood to Decatur. Atlantans don't romanticize the Civil War, don't think of it much at all. Atlanta isn't like Washington and the Northeast; it's not really old. We've built and paved over the battlefields. Sherman destroyed all but about 400 buildings so there is not much antebellum here. There are plenty of historical markers but we don't stop to read them, no prominent monuments. We're kind of embarrassed by it all, don't have much connection to the 12,000 casualties. When you are cruise East Atlanta - and you should - make the circuit of Metropolitan Avenue and McPherson Avenue, two surprising streets. At McPherson and Monument Avenue, you'll find this cannon. A Union general, James B. McPherson died here. It's a history jolt. Finding great houses in Buckhead, scene of the Battle of Peachtree Creek, is like shooting fish in a barrel. You should certainly do it. Cruising Glenwood Drive, Memorial, and Edgwood from East Lake to Oakland Cemetery is more challenging but it's a must. You'll want to start or finish at Meadow Nook (1856). You'll find this cannon where Glenwood crosses I-20, where Confederate General W.H.T. Walker was shot. Exploring brings unexpected rewards. Look for houses and architecture and find hallowed ground. 7,000 Square Foot Morningside Bungalow - Two Kinds of Buyers? This was a Morningside tear down, just completed. I've watched them build it and now I've been to the open house. Would you believe it has nearly 7,000 of finished space? Nearly 1,500 of daylight bonus space? Elevator shaft? Here is the listing. The architect, Linda deLarios, and builder, Yorkshire Properties, L.L.C., used the slope to camouflage the size. It looks perfectly in keeping in our 80 year old neighborhood. A McMansion would be more typical. Instead, this is the best integrated - stylistically - new house in the neighborhood. Personally, I prefer a charming facade that fronts an impressive space - one that gets better the further you go. I guess I'd rather not show everything I have to strangers. The other type of buyer, those who want an impressive facade won't like this house. Here is the front porch. The craftsman details extend throughout the house. Does this look new? Well, it looks clean. Not a showy front door. The front porch overlooks the Palladian style Morningside Presbyterian Church and our amazing trees. The craftsman details are everywhere. You'd never expect this from streetside. The door next to 2 windows open into the kitchen. A few urns on the patio, open those French doors and we're ready for a city party. Neighborhood zoning requires 7.5 sideyard setback. If you can't deal with that, you can't live in Morningside. The listing can't convey how big this house is. It is be one of the biggest in the entire Morningside, Lenox Park neighborhood. Hooked on Houses is hosting her "Hooked on Fridays" blog party; I hope y'all will click here and have look. This week. I'm hooked on 3 Atlanta bloggers. Things That Inspire and Tara Dillard brought some clarity to my fuzzy thinking. I enjoy finding simple ideas and metaphors that help me understand design. 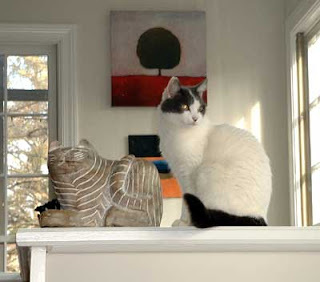 This post is not about cats: This picture is in memory of Lilly the cat who did her best to make our family room look good. Have you seen Things That Inspire's last 2 posts fantastic posts on windows? We Architecture Tourists notice windows before we notice decor. If the architecture is wrong, it's hard to overcome with decor. Her latest post, "Light on Two Sides" illustrates Design Pattern 159. LIGHT ON TWO SIDES OF EVERY ROOM. Inspire and I had been discussing the design patterns "off-blog." Many of "Inspire's" commenters talked about the trade off: more windows mean less wall space. That rang my bell. We have a lot windows. Our designer friend Gordon always bugs us to put something interesting outside the windows: Something to pull the outside in and the inside out. And whatever is outside needs to be lit because a window at night is just a black shiny thing. If the windows take up decorative indoor wall space, put decorative items outside the windows. The effect extends your room. I think I've got the idea but I'm unable to explain it very well. So this week I discover Atlanta blogger Tara Dillard and have one of those slap my forehead moments. Tara's term for the idea is "Vanishing Thresholds" the merging of indoors and outdoor design. Go over to Tara's site. She explains it better than I can. Dan Curl's brother was bitten by a Copperhead Snake in an upscale Atlanta suburban subdivision. He was just taking a walk on the sidewalk after dinner. He's OK. Dan interviewed his brother in the hospital. Be more careful out there. I sure am. As near as I can tell, Dan is Atlanta first blogging home inspector. He was an "eco-inspector" before it was cool. Here is a picture to honor Things that Inspire's "Light on 2 sides" post. These are some of our corner windows. We didn't realize it until we moved back in, but this room has north, south, east, and west facing windows. Most face north and east, the Palladian faces east. I'm not sure how Bill did it but I know he did it on purpose. I'm sure he knew we'd eventually catch on. Thanks for coming by and please check out all the bloggers at Hooked on Houses' "Hooked on Fridays" blog party. The Architecture Tourists haven't done this "first Thursday" stroll before. A rainy but comfortable Atlanta night, it was as if they put the whole show on just for the 3 of us. The slide-show at the bottom of the post has much more, including the Dog with Goldfish. Here is an A-T Auxiliary member, Rachel, with 4 of her favorites by Sarah Dixon at TULA. Featuring galleries on Bennett Street, Peachttree Hills, and Buckhead propper, you can't do this all in one evening. We concentrated on Bennett Street. It's almost hidden from Peachtree Street just north of Piedmont Hospital. Would this view attract you to an upscale galley and antique district? If you are in the know, yes. Personally, I love re-purposed warehouses. The best architecture lives many lives. We met several of the artists. Here is Anne Neilson. She was opening her exhibit "Angels in our Midst" at Ann Irwin Fine Art. She came down from Charlotte for the opening. Here is Paul Rodecker who was exhibiting "Drawing Correspondence a collaborative art project by Angus Galloway and Paul Rodecker" at the lower level space of the Museum Of Contemporary Art of Georgia, MOCA. We were fascinated by these and Paul showed us his favorites. There are more detailed pictures in the slide show. Joe Camoosa was showing in his TULA studio. Here are just 2 of his extraordinary abstracts. My picture isn't worthy. Here is Marta L. Suarez also in TULA. We are rooster fans so we asked her to share the picture. Shirley Higgins Seguin shared her TULA space with Ms. Suarez. I like the reds and the pear. Ann Rhodes, also in her TULA studio poses with her glowing ballet corp.
Nick has joined the Auxiliary and enjoyed this one by Heather Barron at Bennett Street Gallery. You can see how rainy it was on his shoulders. Here I am, hoping something will rub off from Steve Penley's Einstein at Matre Gallery. Some more great shots from Matre in the slide show. Apologies to Bary Sons and Judie Jacobs, both at TULA. My pictures of their stuff were terrible but you might love their work. There is much more in the slide show. Make it full screen for more fun. P.S. I want to congratulate Atlanta blogger Things that Inspire for an extraordinary post, "Steel Windows and Doors." We can't afford not to use a designer. Hooked on Houses is hosting her "Hooked on Friday's" blog party: I'm hooked the value of professional design. This documents a moment in time for us. Picture to right is JoAnn (TK's wife) and Gordon with paint chips picking exterior colors for a yet to be done project. We've worked with three designers and 1 architect, Wanda, Susan and Bill (architect), and Gordon over the last 30 years. These were great experiences. I think we saved money because the professionals prevented mistakes. We've made some big decorating mistakes and lived with them for a long time. Better to get things right so you'll enjoy them from day one. Everything I thought about decorating was wrong. Everything I thought was wrong about decorating was actually right. I am not a designer / decorator nor will I ever be but I have become a fair critic. I like living with professional results. So the salesmanship thing is big. Early on in the process when I heard "paint the ceiling blue," I snickered to myself. I had to be sold. When I heard "this would be perfect for ...," I had to be sold. Because we'd worked with Gordon, the sales cycle was shorter this time. Later in the process, when Gordon suggested a jungle rug for the office, I became giddy with the idea. I couldn't wait to see it in the room. Gordon is still selling us on putting a fountain in the entrance hall. I'm completely sold on the idea but we haven't been able to choose a specific one nor how to deal with spills. This could go on for years or decades. As things come together, we see results, good results. We're pushovers now. On opinionated designers. I think design / decoration takes a certain kind of personality. Aesthetics is number one. The desire to create beauty for clients is paramount. Dealing with less skilled and equally opinionated clients and their budgets requires extraordinary people skills as well. The conflict between aesthetics and practicality is always there. There aren't any blank checks. An opinionated designer isn't going to abandon his opinions when he's not designing. He wants to see beauty in everything, everywhere, and is upset by the ugly. Tact is everything for a long lived designer, but be prepared. You sense that the designer is meddling in your personal life. He. is. Designers affect the way you live. "The couch has always been there," is one of my mottoes. So when I'm told to move the couch "over there" my lifestyle is under attack. Experienced designers must deal with how folks live in spaces. Customers can be as resistant to design changes as they are to pink bar stools. Designers have many big chores. Make your space easier to live with. Make your space easy to keep beautiful. Sell professional judgment and educate the client. Bite his tongue to keep peace and family harmony. The client must make compromises but the designer must too. If the client falls asleep on the couch every night while watching TV, the designer has to know about it. It's personal. It seems like meddling. The designer seems like a busybody. Getting into a fight in front of the designer. It's bound to happen. Rummaging around your house, tracking clutter and wasted space is personal. Sure a doctor's exam is personal. But the doctor doesn't come to your house and go through your junky stuff. So when the wife says, "you told me you threw that stuff out three years ago." tensions rise. Taste is always an issue. The mere mention of "purple" can trigger fists and tears. Then there is the budget fight. More spending is always better, and always worse. The end of every shopping day is like Christmas morning. You shop and shop. You've got bags of stuff in the trunk. You don't have clue why you bought what you bought. Ah, but when you get home, you get to open your presents immediately. A professional picked them out specifically for your home. That's about as good as it gets. Shopping gives new meaning to infinity. Our visits to "Antiques and Interiors of Sandy Springs" left me hyperventilating. It seemed like fun, but I'm not sure I enjoyed it until we got back to the car. I realize that my untrained eye can only "see" about 5% of the merchandise. I'm not experienced or focused enough to identify anything specific for our home. If Gordon has said, "Terry, find all the green vases you can," I'd have mission. None the less I would have missed 95% of the green vases. There are too many vases, too many shapes, too many "greens." Shopping for a rug in a store that has thousands isn't much better. Looking for fabrics turns me into a drooling wreck. I'm starting to get a bead on how Gordon manages it. Today we looked for curtain panels for the jungle office. I'm not very excited about it, I just planned to check prices. Gordon's plan was to find some to take home on approval. We headed for Linens and Things. Gordon looked at every single fabric panel and sheet in the whole store. With a swatch of the jungle rug in hand we checked every single one that was in the ball park. We found three and took them home. Gordon stayed on focus long after I was ready to leave. But something else was happening. Gordon wasn't just shopping for us. He was shopping for all his customers, for himself, and for beauty itself. We found beautiful curtains that didn't suit us but we admired them just the same. Our trip to Bombay Trading Company presented another shopping method: Browse cool stores that carry some merchandise in our style. Maybe that's the most fun. There is no pressure to buy anything specific. We're just looking for beautiful things as if we're going to a museum. We saw a nice sconce with a big candle. Gordon imagined a place for it and we browsed on. At the back of the store we saw an incredible mirror. I thought, "what an incredible mirror." It's more incredible that Terry could possibly imagine. It's a bargain and it's marked down 25% below that. It carries both the colors (gold and black) and design of the red rug. It was big enough to be important. It would be a great replacement for the abstract lighthouse picture in the entrance. It would allow us to glance in the mirror before we left the house. The placement (where the lighthouse is) wouldn't force anyone to see themselves in the mirror (which makes folks uncomfortable. We'd have to take down the mirror over "the thing" and replace it with something else. I must convince Terry to get it, even if we have to return it. Obviously I ordered the mirror. We had no plan to get a mirror. Then we stumbled onto the red lamps. They are stunning! I thought, "what a cool looking lamp." It's beautiful, cheap, and on sale. It's perfect for another customer. They are stunning enough to anchor a whole room. These would be a knockout in our bedroom. We didn't buy them but they were a tough act to follow. We didn't feel like shopping anymore after seeing them. I thought about them all the way home. JoAnn and I looked at the on the Internet. We may do it.